Let's talk about awesomeness, shall we? I am currently like Rachel Lynde, 'thinking in exclamation points'! Get out those TBR list, gift giving lists, I-Want-This-More-Than-Any-Other-Book-In-The-World(-at-least-right-now) lists and any other list you have. Ready? Add this to it: The Anne of Green Gables Treasury -Special Edition Commemorating the 100th Anniversary of Anne of Green Gables 1908-2008. Why do you want this book and why is it so amazing? Well, if you like Anne as much as I do and you own multiple copies of Anne of Green Gables (paperback for easy reading, two hardback copies [one 1983 illustrated and one 1935 edition] and OF COURSE an original 1908 edition published by L.C. Page & Co.!) then you might want this book. ~ Orchestrate your garden with flowers that Anne likely (or did have) in hers. The illustrations in this book are beautifully done and, as the authors indicated in their introduction, never show Anne's face. They quote Miss Josephine Barry in stating that Anne had "as many shades as a rainbow and every shade is the prettiest while it lasts." In order to preserve the imagination of the readers of this treasury, the authors requested that Anne's face always be turned away and so it is. I think this is a lovely compliment to Montgomery's readers and I'm grateful that such a request was made as it does allow you to enter Anne's world with a little more ease. The Anne of Green Gables Treasury includes a variety of facts and information, including information about Montgomery herself, the rest of her works, Prince Edward Island, a map of Avonlea & Green Gables farm, a colorful diagram of the Green Gables home, Anne's family tree, a timeline of events and so much more. If you are an Anne fanatic or know of one, I really cannot think of a more perfect gift to give them. I think that the authors have done such a great job not trying to add to Montgomery's work but rather to compliment it that I could not be more thrilled with it. "Much of the charm of the Anne books lies in those details of everyday life in the Canadian Maitimes from the late 1800s through the end of World War I. As we talked about the books, we began to wonder if our children, growing up in a world of central heating and indoor plumbing, automobiles and shopping centers, television and computers, could possibly understand what Anne's world was really like. So, we took on the project of researching a bit of the background of the Anne books on their behalf." They conclude with what they learned by saying, "We were awed -- and so were our daughters." I do not as yet have a daughter but when and if I ever do, I think wildly enthusiastic thoughts about sharing Anne with her. I think The Anne of Green Gables Treasury is a wonderful showing from mothers who want to share their loves, likes and knowledge with their children. This book just expresses so much of what Montgomery's writing was all about - imagination, love and belonging. Authors Collins and Eriksson really help you to feel that and so they have my gratitude. For more information about this book, visit their website, Ingleside Impressions. If you skip over there, you will note that Collins & Eriksson have a few more titles you might be interested in, including some on the Little House series as well as The Secret Garden and Little Women. (Those titles look equally delightful!) To specifically learn more about the authors, click here. 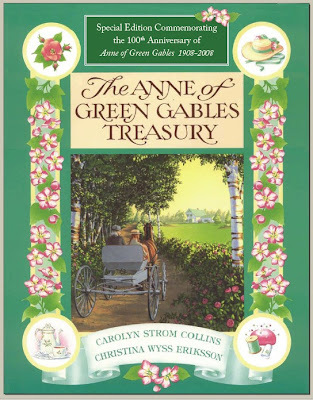 Enjoy this new (or old) discovery of The Anne of Green Gables Treasury ! Anne of Green Gables Treasury! That sounds amazing! I want a copy! Badly! But, seriously. The Anne books (along with the Little House books and the Chronicles of Narnia) were and still are my staples. When I can't figure out what I'm in the mood to read, Anne always fits the bill. I would love to have a copy of this book. I would love a copy! I grew up reading the Anne books and that series is one of the few that I also love as an adult! Thank you! I love Anne! Me, me!! :) I love Anne and cannot wait until the girls are old enough to get their own copy, as mine are to tattered for anyone to read but me. They are like Anne's carpet bag - you have to hold them "just so" or they fall apart. :) And, I'm thinking my almost 12 year old neice is getting a copy of the books this year for her birthday/Christmas. Ooh, also! Do you have any inside scoop on when "The Blythes are Quoted" is going to be released in the US? I saw that it's on Amazon's Canadian site! I love Anne of Green Gables. I've read the books long ago and would love to read them again!!!! My favourite series of all time: Anne of Avonlea. I read all the books,saved every penny from my allowance to go to the bookstore and purchase my very own hardcover copy. I believe they cost around $7.00--back in the early 70s. Worth every penny! The moral of this story is, if you're Carrie Brownell and you start a sentence with "if you like Anne as much as I do", most people will just give up and stop reading right there. OMG, WANT! I love Anne. Being a redhead I loved reading about another capricious, precocious redheaded girl. Please enter me! Thank you!! My email is bibliophile at bostonbibliophile dot com. I love the Anne books. The are so timeless. I enjoy them as much now as I did when I discovered them at 13. They are my all time favorites! I love Anne and anxiously anticipate the day when I can introduce my daughters to her. I'm waiting for the perfect age when they will understand the thrill of the books (and movie)! Thanks for offering the giveaway. nIt is wonderful to get a book like this. Would really love to be included for this. I would like to win. As you know, Amanda and I both only JUST discovered Anne during your challenge last year. But we both loved her. Amanda has not moved on beyond the first book, but I hope she will, and perhaps this book would encourage her to dig back in. What a lovely prize! I didn't read or even hear of Anne until I was an adult and had seen the first film on PBS. I loved Anne and her imagination and how she grew into s spirited woman. I want to read them again some time. Oh, this sounds absolutely wonderful. My oldest daughter and I both have read all the Anne books. What a wonderful book. I would love to own a copy. Please enter me. Thanks! Since my name is Anne, I have always identified with Anne---I even dye my hair red now.....I would love this book!!!! Anne Shirley is one of a kind! There aren't many movies that I can say that about, but she is so innocent, talkative, a struggle for Marilla, etc. Can't say enough. I would absolutely LOVE to have this edition. Would be nice if everyone who signs up could get one. She's my all-time favorite. I don't think I've ever read them, but I am determined to correct that. My mother would just love to have a copy. She lost her childhood copy throughout her family's many moves and has missed it ever since. This would be the best gift for her. This looks like so much fun, and I love the background of mothers researching for their daughters. Since I've already shared Anne with my 5-year-old daughter, this would be a perfect addition to bring more of Anne to life for her. Would love to have a copy to share with my Grand Daughter. You do know how to make me add things to my book list! I'll see if I win it and if not I'll head to Amazon! I love the Anne books and have read them all many times! Would love a copy of this book! I LOVE Anne of Green Gables. My husband doesn't understand why at 29yo I still NEED to read these books over and over. I can't wait to share them with my daughter when she's older. Just found your blog and it is a bright spot to my day! OH! OH! OH! I love Anne of Green Gables and so did my daughters - we had the set of the books while they were growing up and they literally read them to pieces! I have wanted a set for so long. Not only for me to enjoy again as I didn't get much of a chance to while the girls had them LOL and would love to have them for my grandchildren. What a nice family memory this would make. And I MIGHT let the girls read them too. LOL Thank you for entering me. Yesyesyesyes, oh yesyesyes!!! What an exciting prize! OOHOHOHOH!! Our entire family loves the Anne books (and the movie series of course...), DH listened to the audio books, DD and I read out loud, and we've read a child's bio of L.M. Montgomery too!! I am such a huge fan, and now I have a daughter is old enough to be a fan with me :). I love Anne! I have all the movies but none of the books! Thanks for the chance to win!